Wheelchair ramps can be a valuable tool in meeting access challenges, whether at home or in the workplace. From singular disability ramps to curb and threshold solutions or larger modular ramp systems, wheelchair ramps provide accessibility and freedom to mobility chair users. 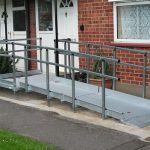 It’s vital to ensure all wheelchair ramps are suited for purpose and are constructed properly. Here’s what you need to know about ramp safety to make sure all ramp users stay safe and secure. Excessively steep inclines are unsafe as they put strain on manual wheelchair users or on engines of motorised chairs. Worst case scenario, steep slopes could even cause a chair to roll or tip backwards. UK building regulations for permanent ramps require a 1:15 gradient. However, this may not always practical for portable ramps due to space restrictions. Use the guide below to assess the best gradient for you. You should also check the width of your ramp will easily fit the wheelchair, with margin for safety on either side. Wheelchair ramps must have a level landing at both the top and bottom of the ramp. The landing should be flat, at least as wide as the ramp and able accommodate the length of the wheelchair. The landing could be an existing surface, or it can be constructed as part of the ramp. Landings should also provide a rail or wall at the top, so the user does not go off the side. If the landing is in front of a doorway, there must also be enough space for the door to open comfortably. Providing a gradual transition between a ramp and its landing level is essential to keep the wheelchair user safe. Usually, the weight of a wheelchair is on its rear wheels, however when descending a ramp, the weight transitions to front wheels. Without a gradual transition, when a wheelchair’s front wheels hit the landing, it can come to a sudden stop and cause the wheelchair user to fly forward. Safe handrails help guide the user up or down a ramp. Wheelchair users may use them if they’re unable to push themselves up a ramp on their own or to hold on to if they feel tired or unsteady. It’s important to choose a ramp with a non-slip surface to make sure wheelchairs do not slip or skid. Keep surfaces and landings free of debris and make sure water is not able to accumulate on them. Ramps are designed for different types of wheelchairs, such as manual, electric, occupied and unoccupied wheelchairs. Consider who will be using the ramp to ensure you select a ramp with sufficient loading capacity. Check the specifications on ramps you are considering and ensure it will safely support the user and their wheelchair or mobility scooter. Outdoor ramps should provide particularly good traction and be weather resistant. It’s important to make sure that ramps remain safe to use in difficult weather conditions such as heavy rain, snow or ice. When required, take additional safety measures such as gritting. Shop online using our ramp comparison tool or call to speak to one of our ramp experts today on: +44 (0) 1920 823940.